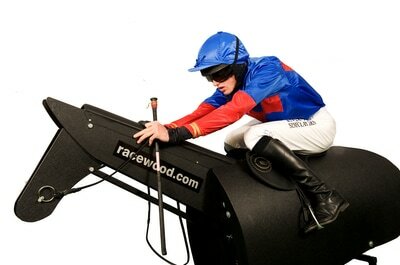 As used by the professionals this is one of Racewood's most popular simulators – the ideal yet affordable fitness tool for aspiring and professional jockeys alike. Racewood's unique, patented system ensures that the head, body and padded leather neck all move in perfect synchronisation which simulates perfectly the smooth flowing ride of a galloping horse. "This really is the essential tool for anyone wanting to ride in races. It is the only way to work on technique and fitness in a controlled environment while simulating the real experience of being on a horse." Using a patented and robust design, the RS arrives fully assembled and ready to use, just fit the race saddle and you're good to go. The RS is used all over the world, by professional jockeys as well as top race schools; from the British Racing School to the Hong Kong Jockey Club. 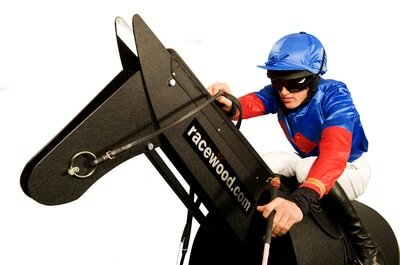 Also widely used by the Injured Jockey Fund.